The hobby of model rocketry has been around for years, and is a thriving industry (Companies like Estes, Apogee etc)– there are many shops specializing in the equipment. I am not going into the details of the hobby here – there are doubtless better websites dedicated to model rocketry. To me the idea of going to a shop and buying a model rocket motor is rather boring. 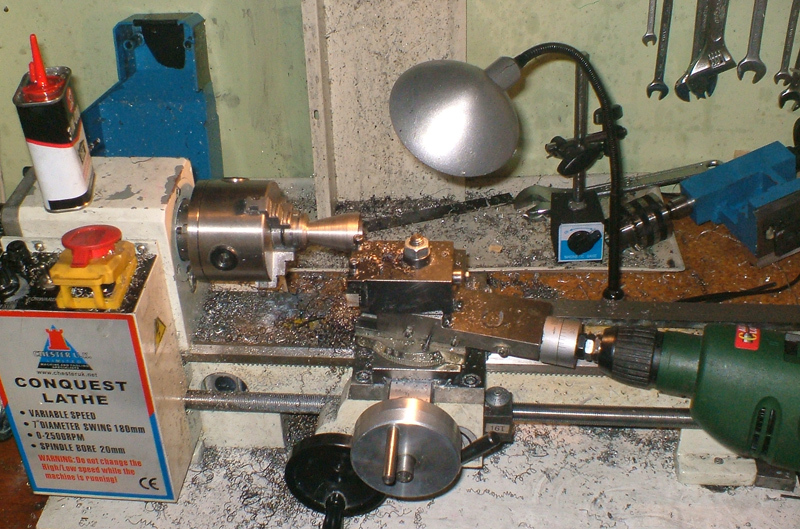 It is far more fun to make a model rocket motor on the mini-lathe. I am discussing solid fuel model rocket motors which I have made on my mini-lathe – not complete model rockets. A model rocket motor consists of the various elements. First there is a length of round metal tube. The holds the fuel for the model rocket motor. One end has a removable lid to allow for refueling. The other end has a nozzle. The solid fuel of the model rocket motor is made from a mixture of potassium nitrate and sugar. This is made by melting together the ingredients over an oil bath, and then casting them into the required shape. Solid fuel model rocket motor fuel is normally cast into a cylinder shape with a hole bored down the middle. The purpose of the hole down the middle is to increase the surface area of the fuel element; it will normally burn on all surfaces. A motor can be re-used by inserting a new solid fuel grain into the top of the motor. When the fuel burns, the combustion gases can only escape out of the narrow throat in the nozzle. This causes the pressure in the combustion chamber to rise. When solid fuel model rocket motor fuel is exposed to a higher pressure, it burns faster. This increases the pressure etc. The force of the combustion gases coming out of the nozzle generates thrust. Quite a bit of thrust actually. Even a small motor with only a few hundred grams of fuel can generate 100lb of thrust. Commercial rocket motors and solid fuel model rocket motors are avaiable. Estes are a popular company for making rockets motors. Apogee are another model rocket company. 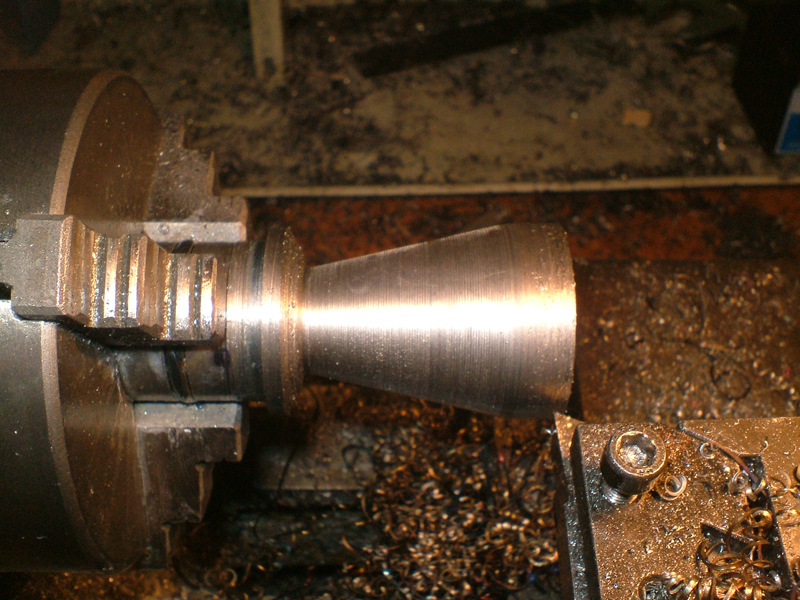 A rocket nozzle is the interesting part to make on the mini-lathe. 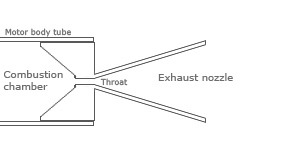 A typical rocket motor nozzle is a show in the diagram below to the right. It plugs into the end of the rocket motor body round metal tube, usually sealed with a rubber O-ring. 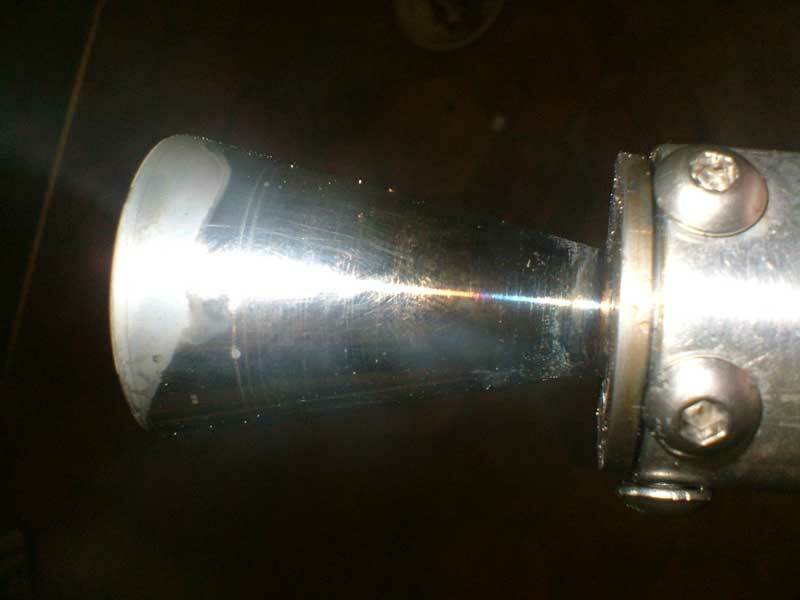 The fuel burning in the chamber is compressed by one taper into the narrow throat of the rocket, and it escapes out of the tapered exhaust nozzle. It is the cutting these tapered parts which is the most fun on the mini-lathe! Rocket motor nozzles have to be made out of steel. If you used aluminium, a nozzle would only survive one or two firings before it would be destroyed because the temperature of the burning fuel is hot enough to destroy the aluminium pretty quickly. However, making such a complex part out of steel is a challenge – steel is very hard and 3 times more difficult to machine than aluminium. On our mini-lathe, we must adjust the angle of the top slide to match the required taper angle. The carriage is then locked, and the top slide is used to move the tool and cut away the metal on the work piece. I use an electric drill with a screwdriver setting instead of the usual hand handle. This makes fast work of moving the tool backwards and forwards during the extremely repetitive cutting process. Whilst this is all fine for the exterior taper – what about the inside? To make the inside tapered surfaces of the nozzle on the mini-lathe starts off with some drilling. We start with a small drill bit and move up through the drills making increasingly wider but shallower holes until the inside tapered surface has been roughed out. Then you can use a very small boring bar and the top slide (with drill) to smooth out the steps and finish the inside surface of the taper. The final stage of making the nozzle is polishing. All the surfaces should be sanding very smooth with various grades of sandpaper and then polished to a glossy shine with metal polish. It is particulary important to polish the throat - it is better for the flow of combustion gases. This image shows me cutting the outside taper of the exhaust nozzle on the model rocket nozzle using the power drill to assist with the manual labour of using the topslide to cut tapers. Using the drill also helps get a smoother finish. Here we can see the nozzle chucked in the mini-lathe. I am using the 3 jaw self centering chuck. I am finishing up the outside of the nozzle. Here is the finished nozzle just after a firing. As you can see the heat of the combustion has done some funny things to the temper of the steel nozzle.